Some of these books have been sitting there since late 2014. It's like a pile of broken promises that I see every day. I also have a library book out, Living Forward by Michael Hyatt. 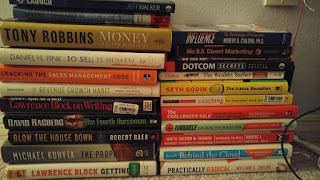 Money by Tony Robbins is the one I want to finish by the end of July. I heard his podcast with James Altucher and I was hooked. To Sell is Human by Dan Pick will be next because I heard his podcast too.